The software package MonogenicJ performs multiresolution monogenic analyses of 2D images. It extracts wavelet-domain features that characterize the local orientation, the phase and the dominant frequency of an image patch at various levels of resolution. The package is available for download as a Java plugin for ImageJ. redundant where all features maps are displayed at the same resolution as the original image. Note that the tensor matrix is computed for each wavelet cell using a local averaging scheme (Gaussian window). 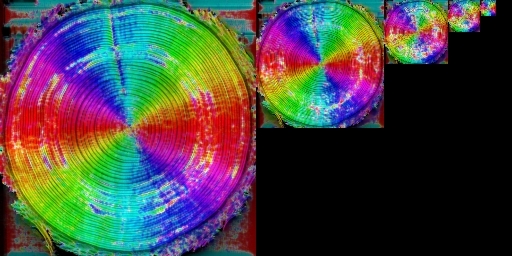 The next step is the wavelet-domain monogenic analysis which is equivalent to performing a 1D analytic signal analysis along the dominant orientation. This is achieved via a steering mechanism and leads to the extraction of the following local features. The complete technical details together with some examples of applications are given in the publication below. M. Unser, D. Sage, D. Van De Ville, "Multiresolution Monogenic Signal Analysis Using the Riesz-Laplace Wavelet Transform," IEEE Transactions on Image Processing, vol. 18, no. 11, pp. 2402-2418, November 2009. The software is a plugin for ImageJ, a general purpose image-processing package. ImageJ has a public domain licence; it runs on several plateforms: Unix, Linux, Windows, Mac OSX. The whole process should not take more than a couple of minutes. 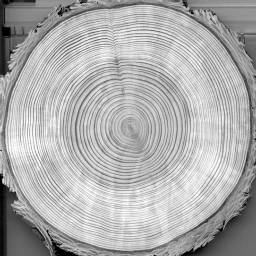 Open the input to analyze (only grayscale image). Select the number of scale J (the width and the height should be a multiple of 2^J). Choose the size of the weighted window of the structure tensor. It is a Gaussian window defined by its standard deviation σ. Select the type the features to display or click on the corresponding Show button. True values: shows the computed values, in 32-float format. Scaled values: shows the a rescale [0..255] version of the computed values in each sub-bands. Stacked presentation: shows the sub-bands as stack of images. Horizontal Flatten: maps horizontally the sub-bands in one image. Vertical Flatten: maps vertically the sub-bands in one image. Color Map: nice way to shows several features at once by assigning at most three features in color channels. 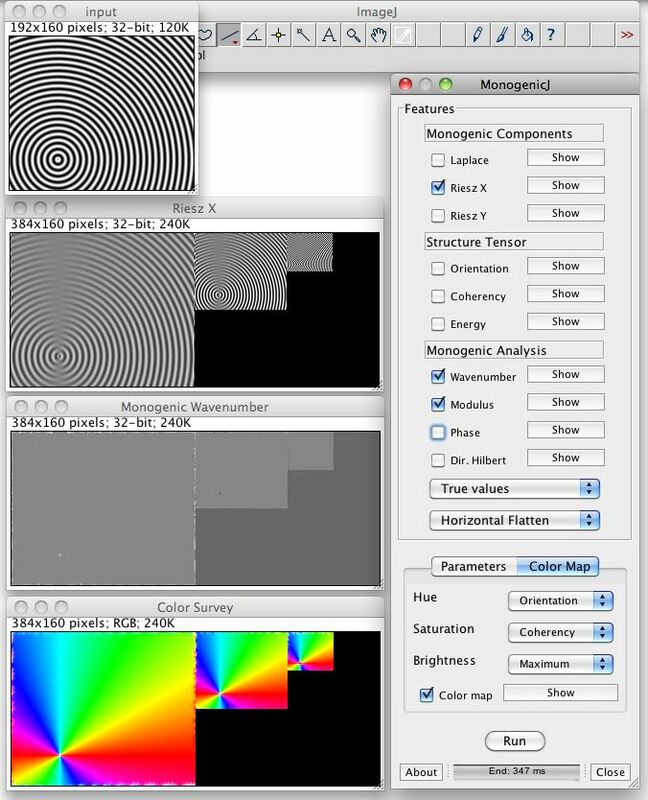 MonogenicJ has a HSB color representation, the hue (H) is often used to display angle (Orientation). Any computed feature map (in addition to the input image and a constant) can be assigned in the hue (H), saturation (S), or brigthness (B) channels. You are free to use this software for research purposes, but you should not redistribute it without our consent. In addition, we expect you to include adequate citations and acknowledgments whenever you present or publish results that are based on it.